Too Many People or Too Much Greed? Peak oil is the Crisis we must face. I hear UKIP supported saying, “There are too many people”.They’re taking all the jobs. No, the truth is there is plenty of room for all. there is plenty of food for all. Oxfam presented the evidence that we can feed the world four times over. But exponential population growth by any species cannot be sustained. In truth population growth, economic growth are the Earth’s resource are linked. There is no sense, little responsibility, but there is Greed The race to the bottom for the cheapest labour is driven by greed. Wars are fought for greed for oil. One day the oil will run out. As a species, we are nothing special. We think we are so much cleverer than any other which ever evolved on Earth. We do not have super powers. Superman does not exist. Neither are we built in “God’s own image”. Like any other species, we succumb to the cyclical powers of nature, whether it is an earthquake, volcano, tsunami or tornado, whether a freak plague of insects, or drought, flood or famine; all of these disasters were written about in ancient times. Like any other species there are limiting factors on our population, but we can maintain a sustainable population by “living within our means” or maintaining a balanced population size (carrying capacity) which is in equilibrium, living within a world able to supply all our needs for survival. Yet it is our own activities which increase the risk of extinction. We have knowledge, but we do not use it, share it or act on it. Why not? I’m talking about common sense. The danger is staring us in the face, while we choose to ignore it time and time again. The price of ignoring the evidence will be extinction of mankind. This can be avoided, but we must act, and we need to start now. It’s time we grew up and stopped pretending. In an interview Professor Hawking spoke to BBC’s Radio 4 Today Programme and answered questions put to him by listeners. He also said it was essential humans colonise space to allow them to spread across the universe. That 95% of oil already has been discovered. It is perfectly feasible for use to energy needs without using fossil fuels or nuclear power. Why evidence presented by Scientists is not being acted upon. Why governments appear to be ignoring all of the above. Warren S Thompson (1887-1973) on population change spoke of the transition from a world dominated by high mortality, autocracy and subsistence to a ‘new’ world of low mortality, democracy and an ever globalising economy. This period (DTM4) of slow but steady population growth he saw earthly paradise in which mortality, fertility were low. His prediction was that population growth would eventually lead to a slow decline in population (DTM5) due to a very low birth rate, a low death rate and a slow decrease of the total population. There are already signs that we are rapidly moving towards a decline due to limiting factors on population. Current global problems such as water, soil and food depletion are signs that human population is growing beyond that sustainable on a planet with finite resources. To survive a species needs to be sustainable and to maintain our carrying capacity (sustainable population) such that the resources are maintained for subsequent and future generations. Paul Chefurka in Population: The Elephant in the Room sees things quite differently than Thompson did, primarily because of oil usage. There is no doubt that the discovery of oil and the introduction of its general use is closely linked to the rapid increase in world population and industrialisation. Over the last 2000 years there has been a steady increase in world population, but a very sudden and dramatic increase in population can be seen to coincide with the introduction of oil into general use in around 1900. 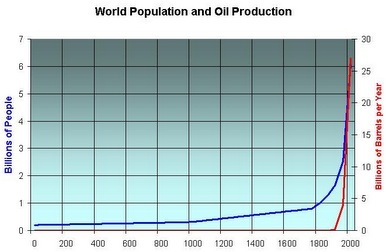 Oil allowed the rapid explosion of population because of industrialisation. Farms could be ploughed by machinery rather than being pulled by the horse, so food production became more efficient. Transport across the globe became a reality. Distribution of food and medicine and other resources became possible over wide geographical areas. It might seem like a dream, like a paradise. But all this is unsustainable. 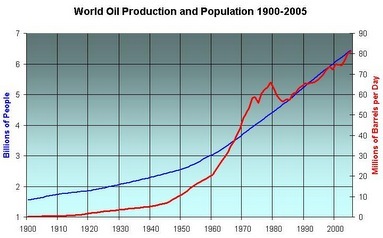 OIl production has peaked, and therefore so has population, and we are set for a decline. The real test of man’s intellect will be how we deal the crisis of Peak Oil. Peak oil does not mean that the world is about it run out of oil. It refers to the point at which the supply of oil can no longer increase. There is lots of the stuff left; it’s just getting much more difficult to find and extract, which means it is getting very hard, and perhaps impossible, to increase the overall ”flow” of oil out of the ground. The good news is that it is perfectly possible to produce energy sufficient to maintain balanced population without oil and without other earth damaging fossil fuels or uranium. HVDC Power Grids distributing power from the world’s deserts via high-voltage, direct-current cables can sustain the energy needs of the population as long as our Sun continues to shine. Add to this hydro-electric power, wind energy, geothermal energy, wave energy and tidal power. 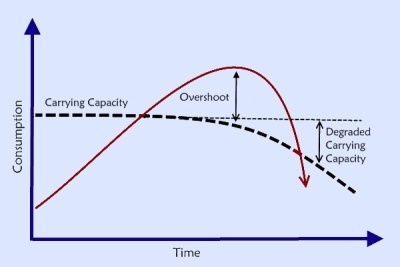 In ecology, overshoot is said to have occurred when a population’s consumption exceeds the carrying capacity of its environment, as illustrated in this graphic. The evidence for Climate Change shows the environmental damage caused by burning fossil fuels. To continue do so without any doubt will lead to disaster, a population overshoot just as yeast in a vat of wine will cease to thrive and eventually die, because of the toxic alcohol levels which the yeast itself produced, so chemicals resulting from our continued use of fossil fuels, or uranium use will take its toll on us, the planet and if we are not careful life itself. 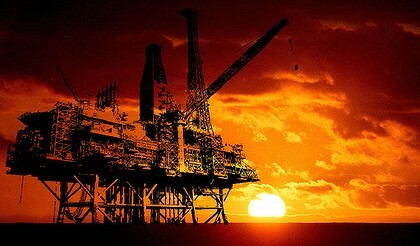 Climate Change and Peak Oil must be taken seriously. The Science is very clear. If no action is taken we look at a future without doubt with massive levels of human suffering. Starvation, disease, flooding and war can be avoided. The population explosion was predicted eighty years ago by Warren Thomson. The prediction has been shown to be broadly accurate. Forty years ago, Limits to Growth reported on a human population model World 3 warning that we had to curb growth or risk global meltdown. It was highly controversial, and not what many wanted to hear. Perhaps it was fear that led to denial. Maybe they were hoping for a Superman. It was reported that Scientists didn’t like Limits because the authors, anxious to publicise their findings, put it out before it was peer-reviewed. The political right rejected its warning about the dangers of growth. The left rejected it for betraying the aspirations of workers. The Catholic Church rejected its plea for birth control. The economists, who claimed human technological inventions would surely solve it all. Most journalists and BBC presenters do not have a background in Science, most having alternative degrees such as history or linguistics. But it is not all about knowledge, it is about political will. Much is spoken about ignorance of Science. Much is spoken about neo-liberalism too. Margaret Thatcher must take some responsibility for the neoliberalism which has resulted in the excessive wealth of a few. But Margaret Thatcher understood Science. She held a degree in Chemistry and worked as a Research Chemist. So Thatcher should have known better. It is not just the reporting of scientific evidence that journalists avoid. It seems that purpose of the media is not to inform at all. Articles are carefully chosen by editors. Censored newspapers print what suits the rich and powerful. If globalisation means anything it should mean that we act as One World. Communication today is possible without jet travel. The time has come for our governments to work together. It is time for the truth to be heard. Governments serve the people. Their legacies will depend on how they act now. There must be an end to lies and manipulation of the media. It is time governments stopped treating the people as children and give us the facts we need to know. Global poverty results from the plutonomy which now controls the earth. In Greece people are already abandoning their children. Can you imagine that? The human suffering which will result from population overshoot is unimaginable. We would expect starvation, poverty, and mass deaths. It is a nightmare, not the dream of paradise. We can avert it. This world must act as One World. Coal is our Heritage not our Future! This entry was posted in Economics, Education, Environment, Globalisation, Health, Opinion, Propaganda, Racism, Science and Research and tagged Alternative Energy, Carrying Capacity, Overshoot, peak oil, population by Pamplemousse. Bookmark the permalink. When they were first devised cars had a push-pull mechanism where if you pushed it they’d run on petrol, if you pulled it they’d run on alcohol. That’s why we’re not allowed to have stills in our gardens and be brewing up fuel at night from leaves and flowers, whatever, potatoes, you name it, and running our cars into work the next day pollution-free on what we’d brewed last night. We could be, but Big Oil used its influence to get laws passed outlawing stills. It even managed briefly to get alcohol banned completely (and famously) for a time (prohibition). Oil can go. We’ll find replacements pretty easily as they’ve always been there. We’ve simply not been allowed to use them. I agree fully with the analysis of the extinction of the human race through environmental factors. Much more influential on this is the “greed mentality”, that was so highly promoted by Thatcher et al, and is now the root cause of the impending problem. If the politicians were acting in the interests of the majority they would be curbing this greed mentality. In fact a move away from the capitalist system, or better still a return to socialism, would be a good place to start because as we now see the idea of an ever expanding market is a fallacy.